Often estimating a project can feel overly complex and difficult, but leadership coach Susanne Madsen shows you how to make it simple and easy. The first thing Susanne acknowledged is that estimates are often wrong. But she didn’t leave it there. She offered these four reason why they can be miscalculated. To avoid these pitfalls she offered using Program Evaluation and Review Technique (PERT), which uses three points to get better estimations. Basically it takes the most optimistic, most likely and most pessimistic estimates and finds the sweet spot. By factoring in a full range of possibilities, you give yourself a more accurate peek into the future of your project. Pro-Tip: You may also want to have your team trained to estimate. By sharing the responsibilities of the job you can get more perspectives and a closer approximation to how long it will take and how much it will cost. Hi, I’m Susanne Madsen [SP]. Welcome to this White Board session on estimation. We will take something that can at times be quite complex and make it simple and easy for you to use. The thing about estimation is that we often get it wrong. There are a number of reasons for that and I’ve written them up on the board behind me. The first one is that we tend to be overoptimistic. I think this is human behavior. If I ask you how long it takes you to decorate your spare bedroom you might say, “Oh, one day, easily.” But once you get there you realize that it takes you a lot longer. Other reasons are that we are not good enough at looking at all the detail of what needs to get done, and we don’t factor in all the aspects. If I ask a builder how long it takes him to build a house for me he might say three months, but we haven’t discussed the fact that I also expect a landscaped garden, a beautiful driveway, a specially-designed roof, and three bathrooms. So we have to talk about the detail of the work before we can reasonably provide an estimate for it. 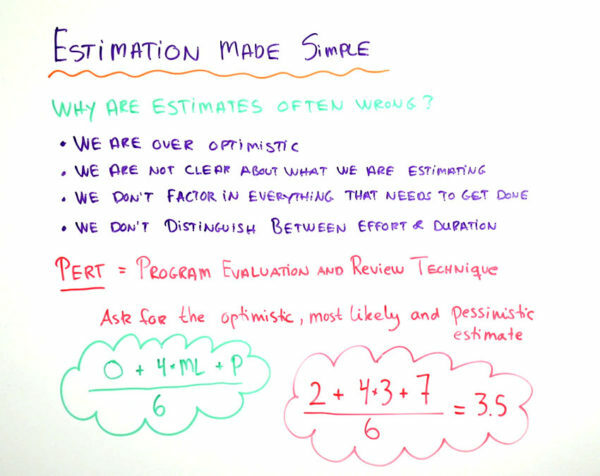 The last reason I’ve written up behind me on the board for why we get estimates wrong is that we confuse effort and duration. They are two very different types of units. If I ask my builder how long it takes him to build my house and he maintains three months, then great. I think I’ll get my house in three months’ time. But what I don’t know is that my builder is also going to work on my neighbor’s house, so he can only be with me every second day. So instead of getting my house in three months’ time, I’m actually getting it in six months. This happens on projects all the time. You forget that your developers are also working on other projects. So do distinguish between effort and duration. Now let’s turn our attention to the PERT estimation technique. It’s a three-point technique that can help you to estimate more realistically. PERT stands for Program Evaluation and Review Technique. What we’re doing here is that we’re taking the most optimistic estimate, plus four times the most likely, plus the most pessimistic estimate, divided by six. It’s a weighted average. Let’s look at an example. Imagine that you’re asking your developer how long it takes to create a new web page for you. He gives you a most optimistic estimate of two days and the most pessimistic estimate of seven days, but the most likely, he says, is three. If you use the PERT estimation technique, you’ll see that that gives you an outcome of three and a half days. If this is an effort estimate, meaning that he is working fully for you, your next task is to find out by when you can get those three and a half days by. Thank you for watching. Please visit us again at projectmanager.com.